Presented by Poor Tom's Gin & Mark Blumer, and supported by Playwriting Australia and ambassador Louis Nowra, Michael McStay’s short play Amongst Ruins (Snake Eggs Hatch) takes place in a post-apocalyptic, famine and poverty stricken environment and sheds light on war profiteering and the moral dilemmas along with the resulting human conflict and lack of integrity that come with its territory. With the motive circling around (enabling) killing people for profit and the backdrop of a war torn city, McStay seems to have not only drawn influences for the story, but taken more than a few pages out of Orson Welles’ The Third Man. McStay seems to go with the allegory that morality in wartime is currency under inflation. Greek and epic styles, e.g. Sophocles’ Antigone, seem to have had a profound influence on the writing of the narrative based on time, space and plot and how all the individual factors tie in together within the confines of forty minutes: It goes straight to the point and does not waste an awful lot of time with nuances or subtleties. Amongst Ruins also incorporates Brecht-esque components, i.e. Mutter Courage, with the merchant in Amongst Ruins being Mother Courage before her kids were born. The cast comprised of Cecilia Morrow, Zoe Jensen, Amy Hack, Ryan Carter and Jack Crumlin play well off each other and their delivery radiates intensity. Another Red Line Productions emission that keeps the high standard the Old Fitzroy is known for. 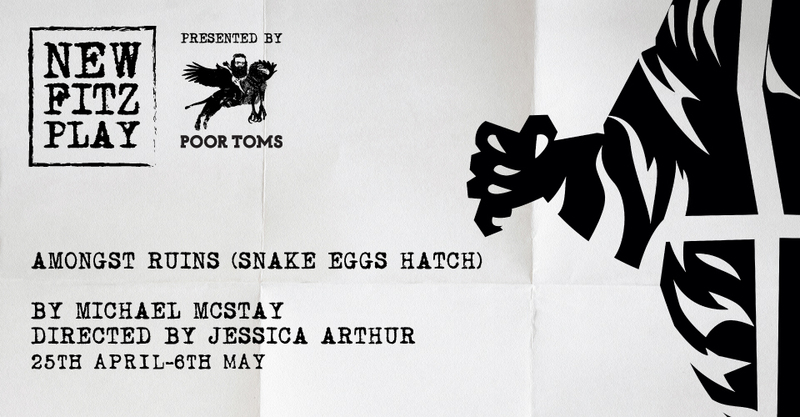 Amongst Ruins (Snake Eggs Hatch) will run April 25-May 6.